Eastern freshman Lucas Finlaw (left) applies a tag to South Gallia senior Nick Hicks (right), during the Eagles’ 23-1 victory on Tuesday in Tuppers Plains, Ohio. TUPPERS PLAINS, Ohio — Beginning their title defense with a bang. 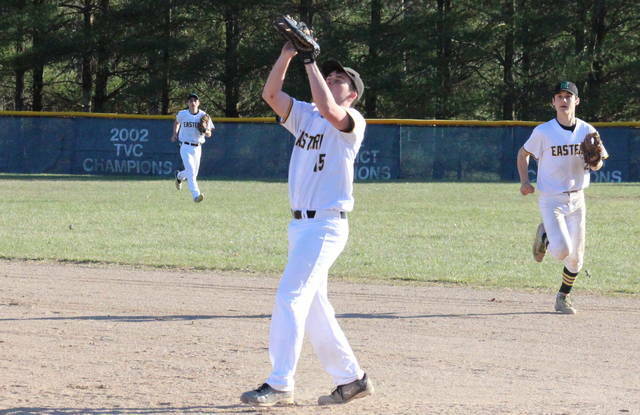 The Eastern baseball team — the 2018 Tri-Valley Conference Hocking Division champion — started its 2019 league slate with a 23-1 victory over guest South Gallia on Tuesday in Meigs County. The Rebels (0-3, 0-3 TVC Hocking) — which began the season with a pair of setbacks at Miller on Saturday — led 1-0 in Tuesday’s contest, scoring after an error in the top of the first. Eastern (3-0, 1-0) — winner of seven straight league decisions — sent 11 batters to the plate in the bottom of the first, and took a 6-1 lead into the second. The Eagles outdid their first inning performance in the second, pushing a 13 runs across after 19 at-bats in the frame. Following a scoreless third frame, Eastern capped off the 23-1 mercy rule victory with four runs in the fourth. 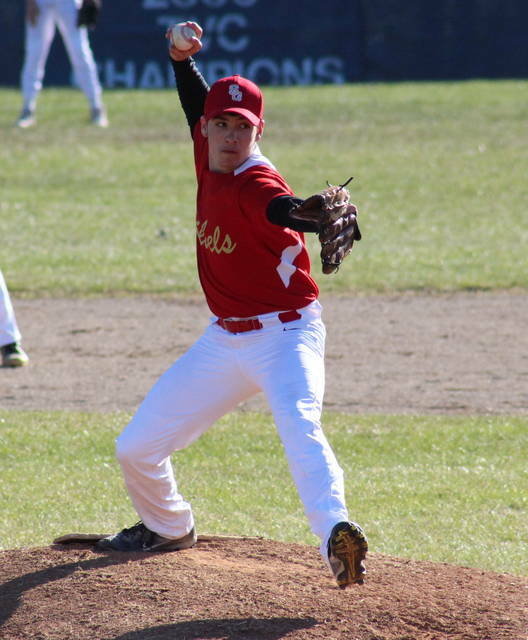 Brayden Smith earned the pitching victory in two innings of work for the Eagles, allowing one unearned run and striking out a trio of batters. Colton Reynolds pitched two innings of relief, allowing one hit and striking out five batters, while John Hobbs struck out two batters in one inning of work. Jared Ward took the pitching loss in one-plus innings for the Rebels. Jeffrey Sheets relieved Ward in the second inning and was in turn relieved by Kenny Siders in the fourth. The SGHS pitchers combined for a pair of strikeouts and a dozen free passes. Leading the EHS offense, Isaiah Fish and Blake Newland were both 3-for-3 with three runs batted in, while scoring three and two runs respectively. Wyatt Watson went 2-for-2 with three runs and three RBIs, Smith added a hit, three runs and two RBIs, while Matthew Blanchard came up with a hit, two runs and one RBI. Reynolds singled once and scored twice for EHS, Hobbs singled once and scored once, while Bruce Hawley recorded a hit and an RBI. Nate Durst scored once and drove in a run in the win, Ryan Harbour crossed home plate three times, while Brad Hawk, Lucas Finlaw and Jake Barber scored a run apiece. 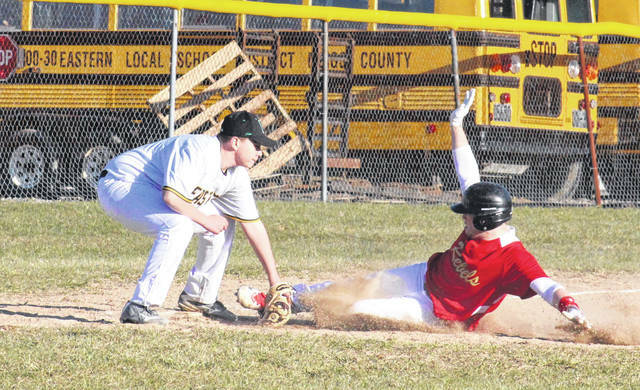 Nick Hicks was responsible for the lone SGHS hit, while Siders scored the team’s only run. 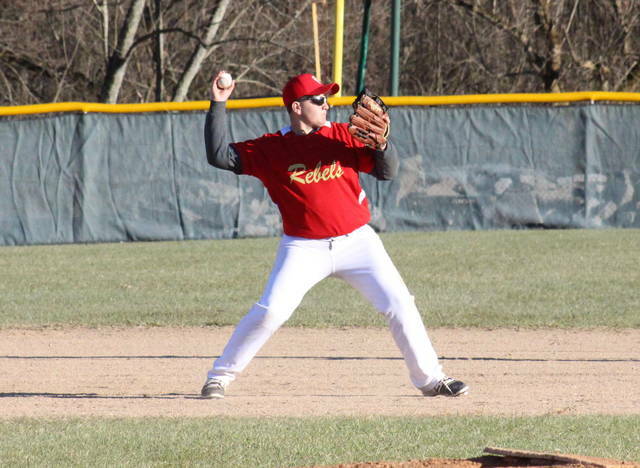 The Eagles committed two errors and left seven runners on base in the contest, while South Gallia ended with six errors and one runner stranded. The Eagles and Rebels will clash again on April 11 in Mercerville. After visiting Belpre on Wednesday, Eastern will return to Tuppers Plains to face Waterford on Friday. Following its home opener against Federal Hocking on Wednesday, the Rebels will be back on the road on Friday at Southern.